Solo Instrumental Grand Piano Compositions - Heartfelt and Melodic. If ever you seek a place of solitude for reflection and respite, listen to Iris’ music. It will elevate your spirit and bring peace to your heart. New for 2013 - Solo Grand Piano compositions by UK Composer Iris Litchfield. Warm, tender and melodic. Quietly enjoy. 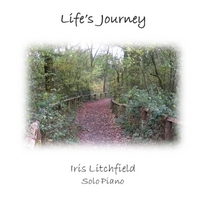 "Life’s Journey" is the latest solo piano release from British pianist/composer Iris Litchfield. This collection of fourteen original classically-styled pieces is relaxing, uplifting, and a joy to listen to. Six of the tracks are new compositions and eight are newly-recorded versions of pieces previously released. Iris’ style is direct and sincere without a lot of flash and fanfare - heartfelt musical interpretations of nature’s beauty, new experiences, and reflections on a life well-lived. The music is immediately accessible and very melodic, with layers of depth that reveal themselves the more you listen. Fellow pianists will be delighted to know that a companion sheet music book is also available. "Life’s Journey" begins with “First Steps,” a delicate confection that expresses the tentative emotions of doing something completely new. Graceful and hopeful, it’s a lovely opening. “Dancing Dolls” is light and carefree with the sweetness and innocence of a child captivated by her imagination. “Clear Waters” is a favorite, evoking images of sunlight dancing on a rippling stream as it gently flows to no particular destination - so peaceful! I also really like “Dancing Shadows,” a lively minor-key waltz with a bittersweet Russian flavor. “Nature’s Serenade” first appeared Litchfield’s 2007 award-winning album with Tom Salvatori, When Evening Falls, and this new version has been expanded a bit - another beauty! “Colours of the Rainbow” has the warm and wistful feeling of a pleasant daydream. “A Mountain to Climb” is another favorite, conveying gentle strength and determination. I love the way the piece picks up momentum as it evolves and develops, always moving forward. “Reminiscing” recalls the joys and sorrows of life, softened by time and distance. “Summers of Long Ago” is more bittersweet and melancholy, but oh so beautiful! I love this one, too! “Twilight Time” brings this wonderful collection to a quiet and dreamy close with a melody so clear you can almost hear the piano singing lyrics. Iris Litchfield has composed a very impressive body of music over the past several years and just keeps getting better. if you are new to her music and looking for some gentle, sweet solo piano, be sure check this one out. If you are a longtime fan, you won’t be disappointed with "Life’s Journey." Recommended!! !